The town of Mostar is one of Bosnia & Herzegovina’s most popular destinations. With cobblestoned streets, old stone buildings, and its beautiful bridge spanning the picturesque Neretva River, this town looks like it was plucked from the pages of a fairytale. This small town attracts thousands of visitors per year. Seeing Stari Most, the Old Bridge, is the highlight of a visit here, but the charm of Mostar extends well past the span of this bridge. 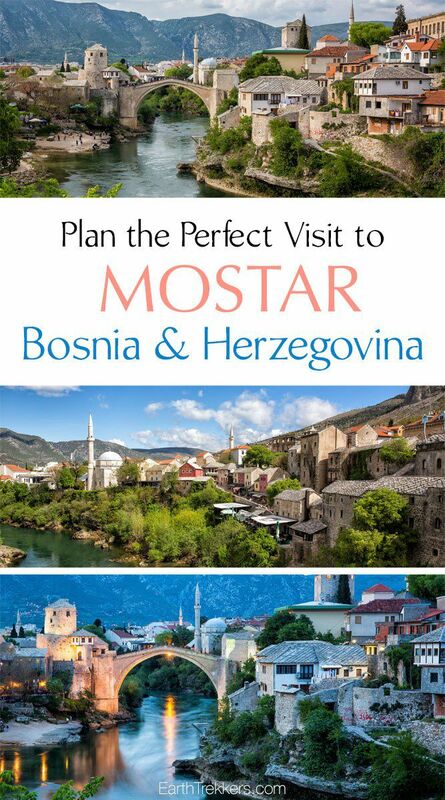 Whether you have just a few hours or a few days, we want to help you plan the perfect visit to Mostar. Mostar is located in the Herzegovina region of Bosnia & Herzegovina. It started off as a small town on a trading route between the Adriatic Coast and central Bosnia. In 1468 the region came under control of Ottoman rule. In 1566, under the orders of Suleiman the Magnificent (the same man who transformed Constantinople into Istanbul), the wooden bridge was rebuilt in stone, and this famous bridge stood for 427 years. This stone bridge was a masterpiece when it was built and it is said to be one of the most important structures built during the Ottoman era. Austria-Hungary took over control of the area in 1878 and ruled until 1918, when Bosnia & Herzegovina became part of Yugoslavia. In 1992, Bosnia & Herzegovina declared independence from Yugoslavia. In 1994, Stari Most was destroyed during the Croat-Bosniak conflict. During the late 1990’s the bridge was rebuilt and the Old Town was renovated. 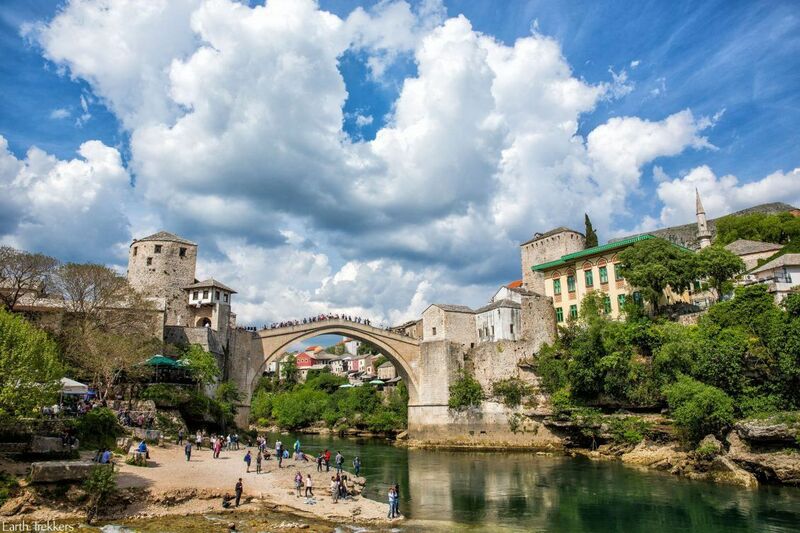 Stari Most was reopened in 2004 and in 2005, the Old Bridge was designated a UNESCO World Heritage Site. Mostar can be visited year round, but the best months to visit are April through October. Spring and autumn have pleasant daytime temperatures but there is almost a 50/50 chance it will rain on any given day. Temperatures can soar in the summertime (100°F, 36°C) but there is very little chance of rain. Winter tends to be the worst time to visit Mostar with regards to weather, since it is very cold and wet. Peak season for tourism is during the summer months. During this time, expect large crowds and hot temperatures. The best months to visit Mostar are May, June, and September, when the weather is pleasant but you avoid the peak crowds of summer. In April and October, there is more chance for rain, but Mostar tends to be much quieter with less tourists (and lower accommodation costs!). We visited Mostar in April. During our first day, we had warm temperatures and sunny skies. The following morning, clouds moved in and it rained all day. Like I said, during the spring months, there is a 50% chance of rain. 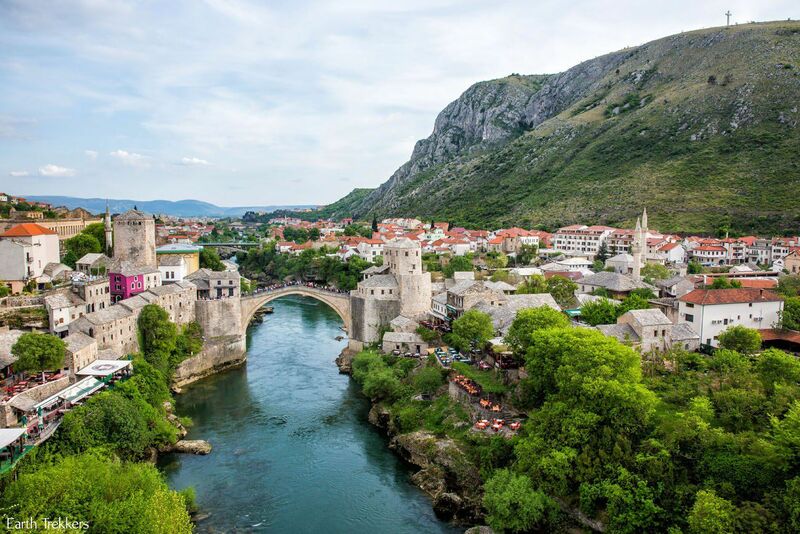 How Long Should You Visit Mostar? Ideally, one full day with an overnight stay is perfect. 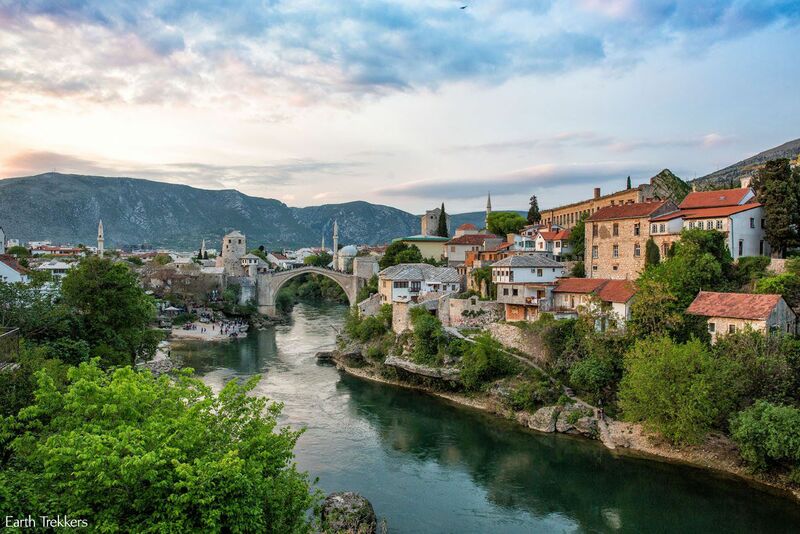 This gives you more than enough time to explore the Old Town, get all the views of Stari Most you want, and even take a quick detour out to some of the nearby sites. Staying overnight also gives you the chance to watch the sunset in Mostar, either from the riverbank or from a riverside cafe. And with more time, if you do happen to get some rain during your visit, the wet weather won’t completely ruin your plans. Mostar also makes a great daytrip, either from Split, Dubrovnik, or Sarajevo. 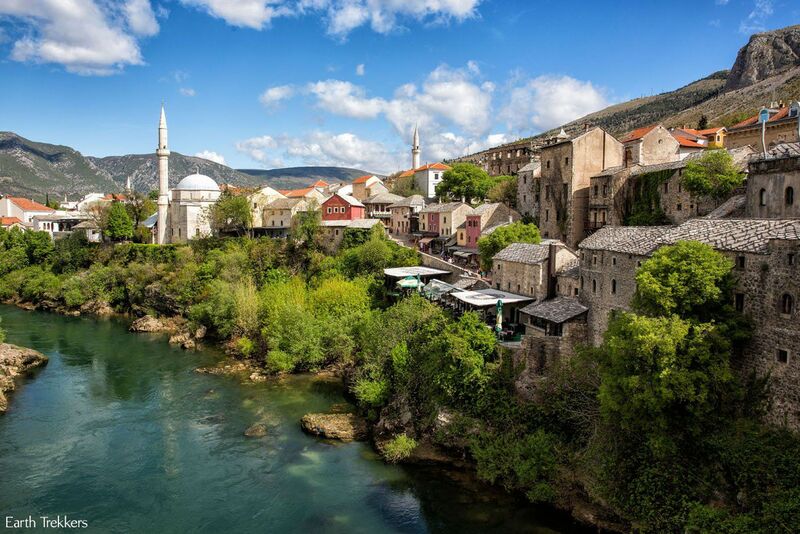 From these towns, you can join a bus tour where you spend the mid-portion of the day in Mostar, with transportation in the morning and evening. 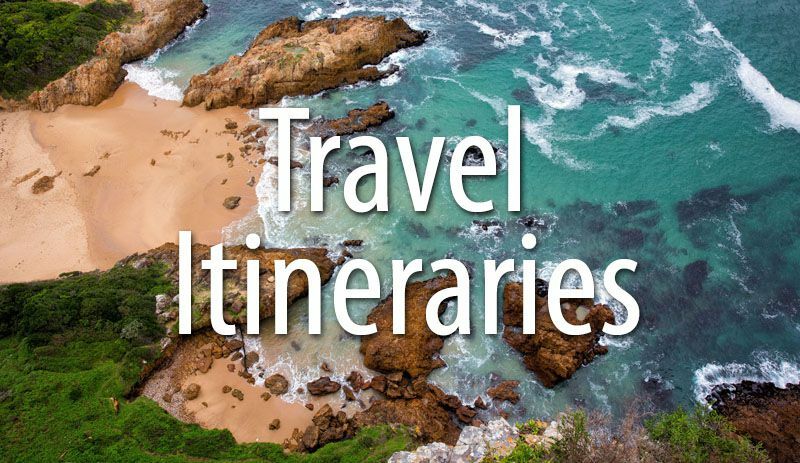 This is perfect if you have limited time in your itinerary. Without a doubt, the Old Bridge is the highlight of a visit to Mostar. Walk across it, take selfies with it, and enjoy the views of the Old Town from the bridge. Watch as divers leap from the bridge into the river. 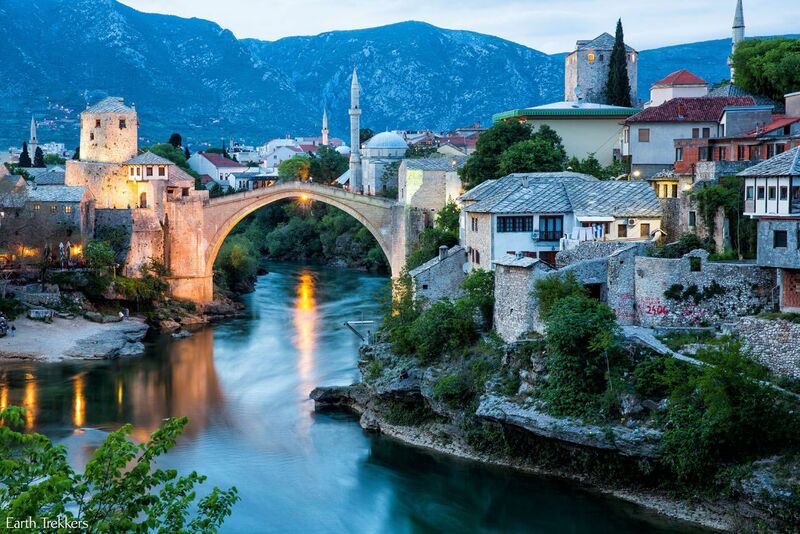 There are numerous spots to get “the best view” of the bridge, from the banks of the Neretva River to the minaret of the Koski Mehmed-Pasha Mosque. To find out where to get the best views of the Old Bridge (and to learn more about the Stari Most divers), read our post Photographing Stari Most: Where to Get the Best Views. Before stepping onto the bridge, there is something you should know. The surface of the bridge is slippery!! There are raised treads to help prevent slipping, but if you place your foot on the smooth rock, your feet may slip, even with shoes with good traction. Walk on the raised stones rather than the smooth, flat surfaces. There is more to Mostar than just a beautiful, fairytale bridge. 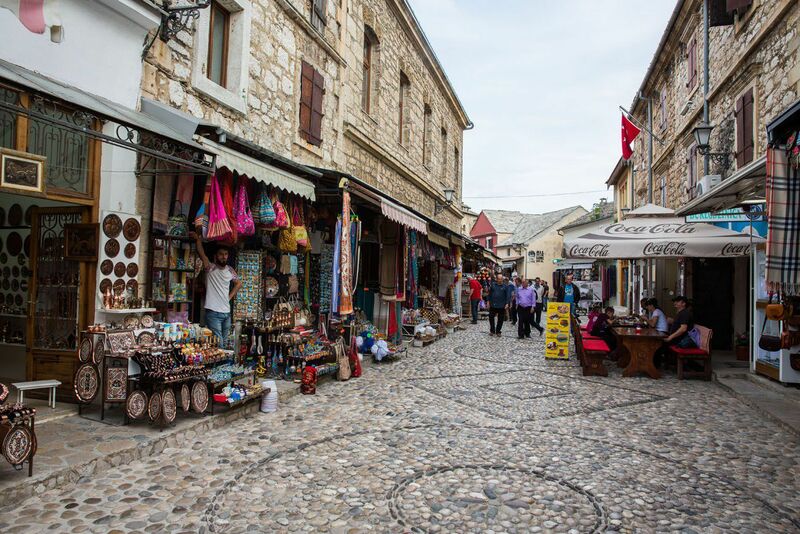 The stone streets of the Old Town are almost as charming as the bridge itself. The Old Town is small. 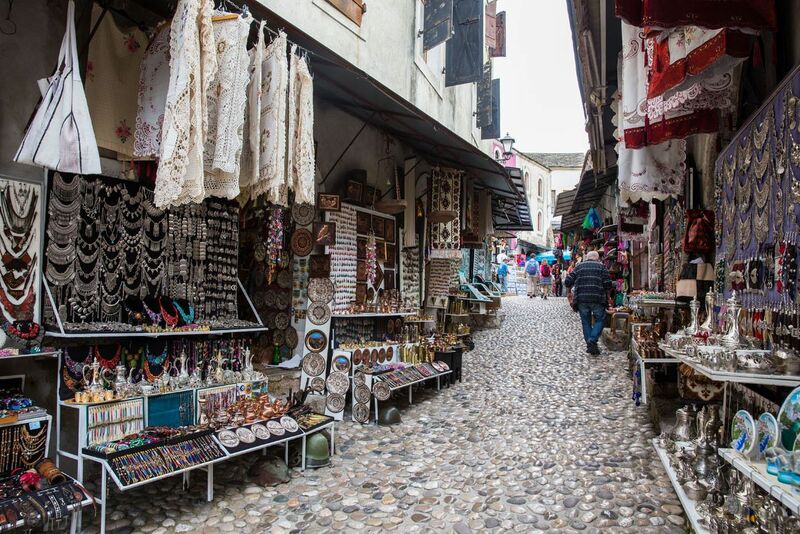 With just a few cobblestoned lanes on either side of the Neretva River, it doesn’t take long at all to walk the entire Old Town. On these streets are cafes and souvenir shops. 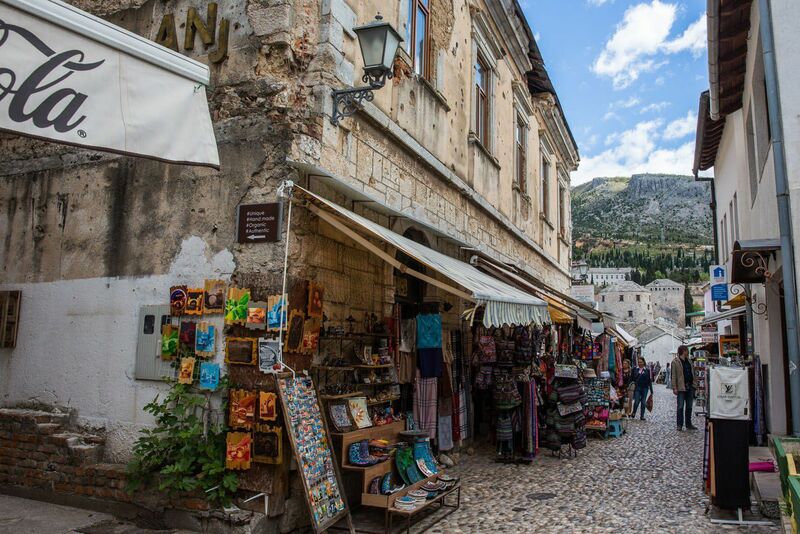 These streets can get quite crowded midday, as day trippers visit Mostar, but at night, the crowds thin and wandering these streets is a joy. Completed in 1618, this is the second largest mosque in Mostar. Like Stari Most, this mosque was almost completely destroyed in the Croat-Bosniak conflict but has since been rebuilt. 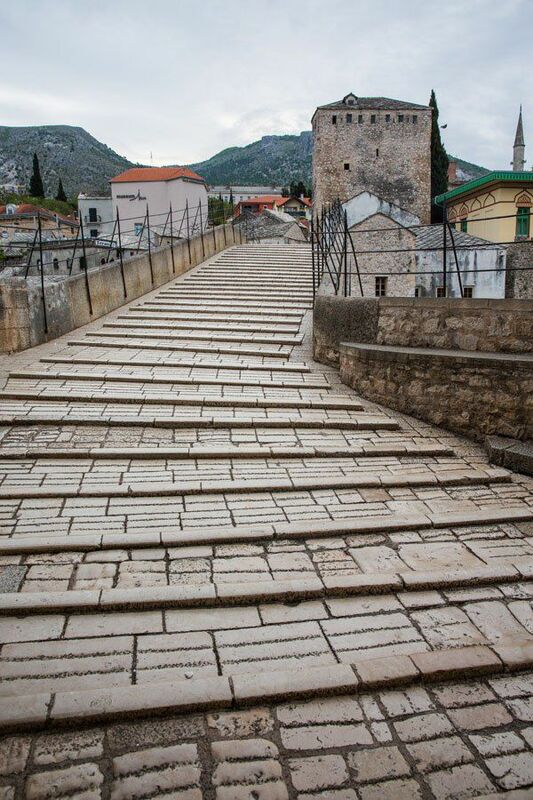 For a small fee, you can tour the mosque and climb the minaret for an unforgettable view of Stari Most. 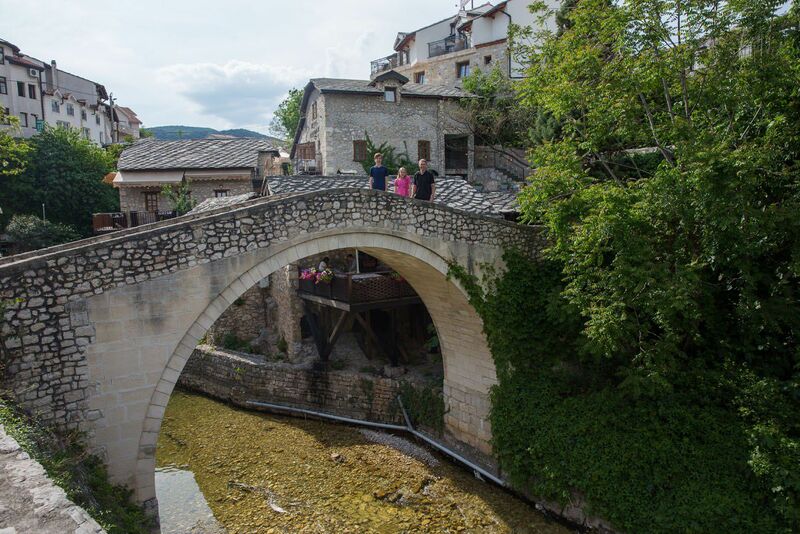 This stone bridge is a smaller version of Stari Most. 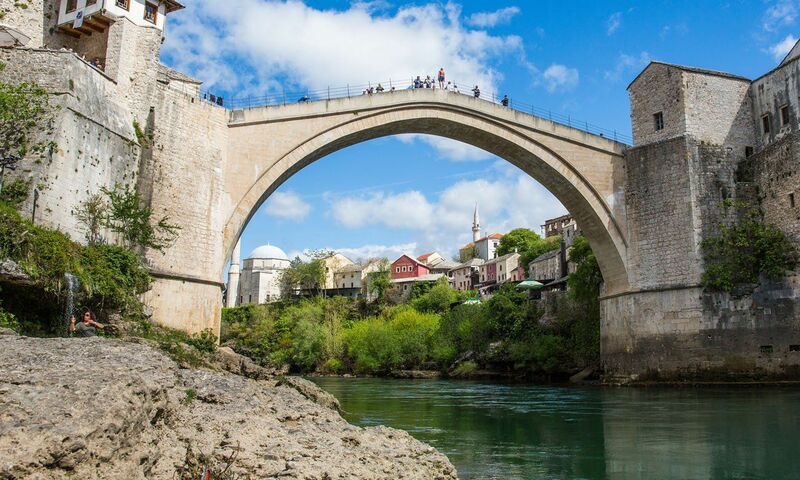 Built in 1558, the bridge was a “test” before the construction of Stari Most began. Located a few minutes walk from the Old Bridge, Kriva Cuprija spans a small creek that feeds into the Neretva River. This market is located in the Old Town, just east of the Old Bridge. Filled with souvenir shops, this small market reminded us of the Grand Bazaar in Istanbul. This is a small exhibition of about 50 photos of the Croat-Bosniak conflict. If you want to learn more about the war and its effects on Mostar, this museum is worth the visit. If you want to see more remnants of the 1990’s war, there are several sites located outside of the Old Town. These include the sniper tower, Tito’s Palace, and buildings still riddled with bullet holes. Even in the Old Town you can still see scars of the war. This resembles Plitvice Lakes in Croatia, only on a much smaller scale. This is a scenic spot, quieter than the city of Mostar, with a chance to go swimming if the weather is warm enough while you are here. 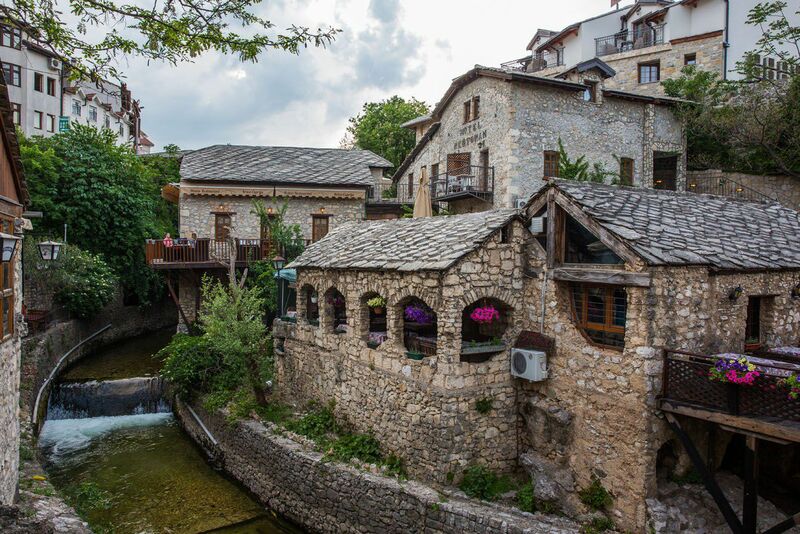 Blagaj Tekija is a Dervish monastery built at the base of a cliff on the Buna River. See it in photos here. This is the most convenient option. 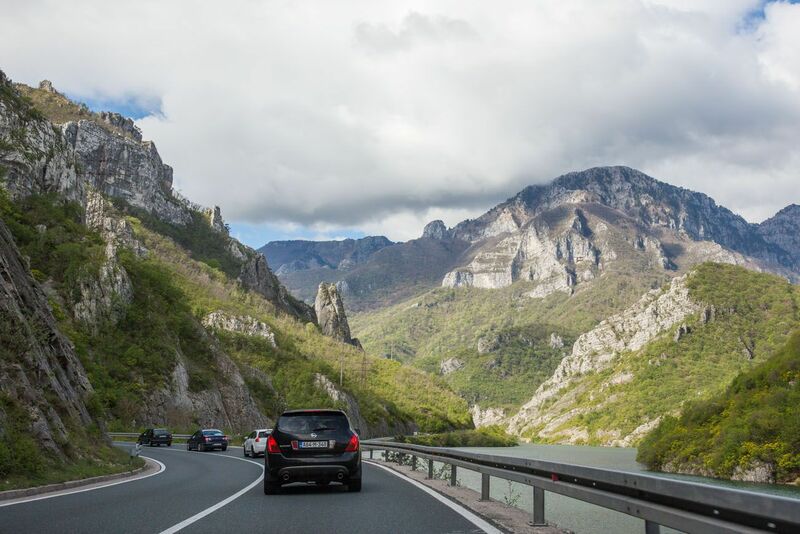 We rented a car in Sarajevo and did a ten-day road trip through Bosnia & Herzegovina, Croatia, and Montenegro. The Old Town is pedestrian only so you will have to park your car in one of several pay-to-park parking lots near the Old Town. Crossing the border can take five minutes to an hour or longer, depending on traffic. In our experience, our border crossings took from five to ten minutes, but we were here in April, during shoulder season. We rented a car in Sarajevo and drove to Croatia and then Montenegro and then back to Sarajevo. We used Europcar simply because they offered the best rate during our visit. 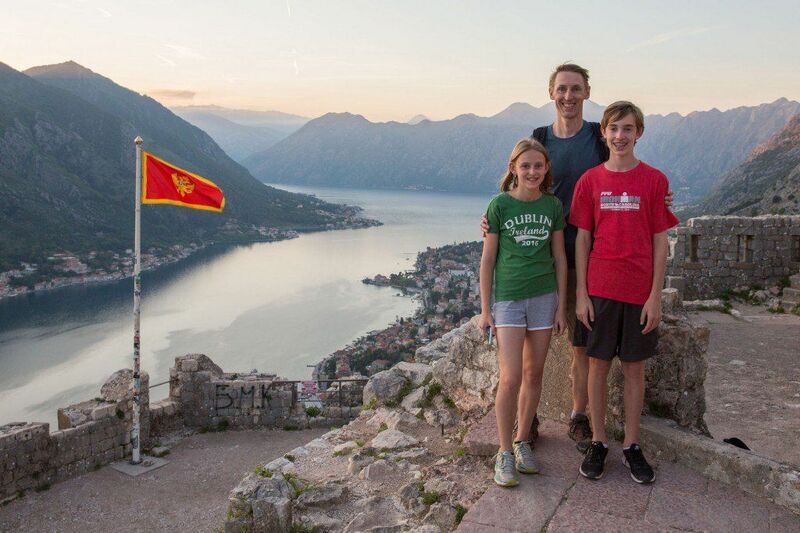 If you rent a car and drive in Bosnia & Herzegovina, Montenegro, Albania, or several other countries in Europe, you will need to have a green card. A green card is a cross-border insurance card that proves that your car has at least minimum level of insurance required. We obtained the green card through Europcar, paying $2.34 USD per day. Read more about the green card here. If you drive between Mostar and Sarajevo, it is worth a quick visit to Konjic, a beautiful town located on the drive. 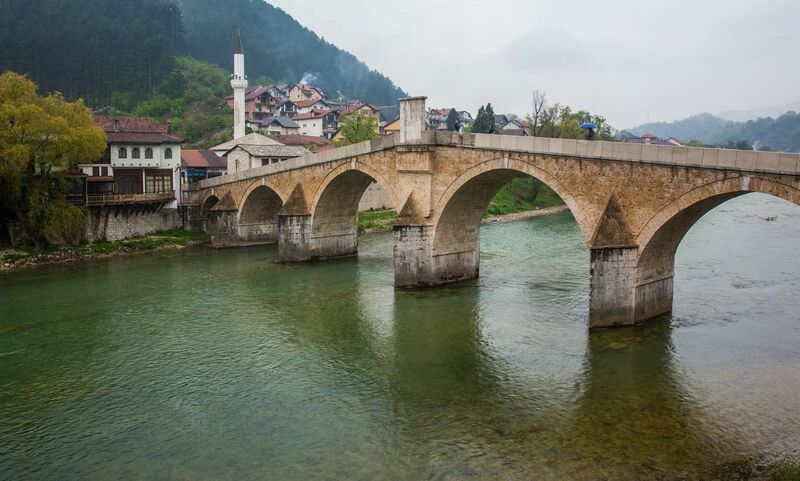 This is your chance to see another unique, gorgeous bridge in Bosnia & Herzegovina. And by the way, the drive between Mostar and Sarajevo is stunning, with tall, green mountains and small towns. There is a train that runs between Sarajevo and Mostar. There are two trains per day making the journey during the summer months and there may only be one train per day at all other times of the year. Here is a link to a blog post on rail.cc with more information. 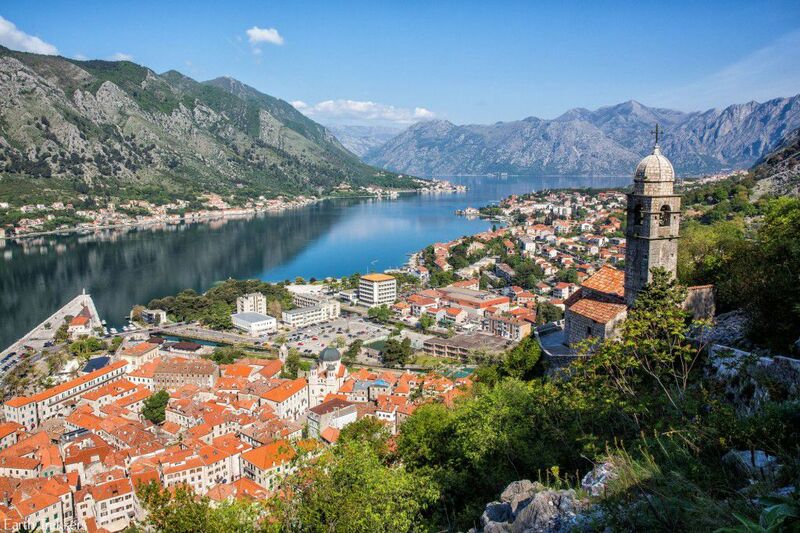 Numerous companies arrange full day tours to Mostar, usually from Dubrovnik or Sarajevo. 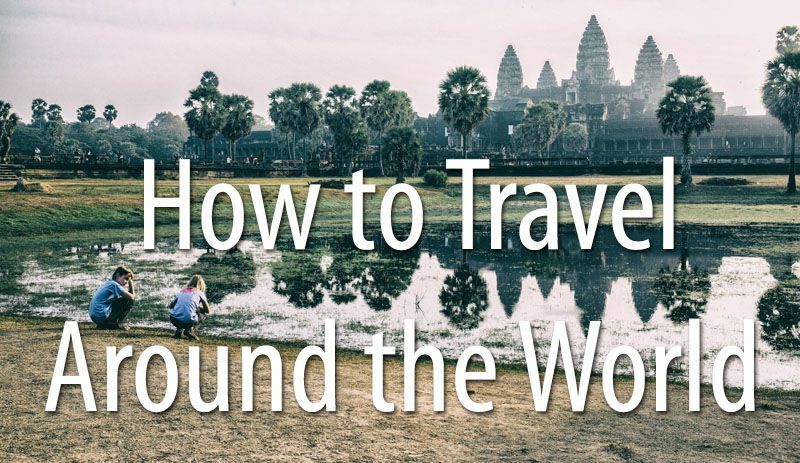 These tours start around 7:30 am and get back to your starting city after dinner. 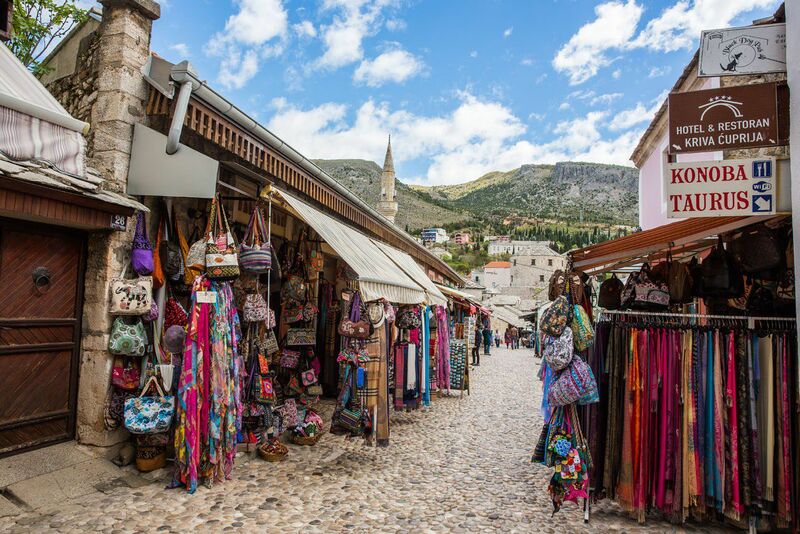 Because of driving times and stops at other sites, these tours only give you two to three hours to explore Mostar. 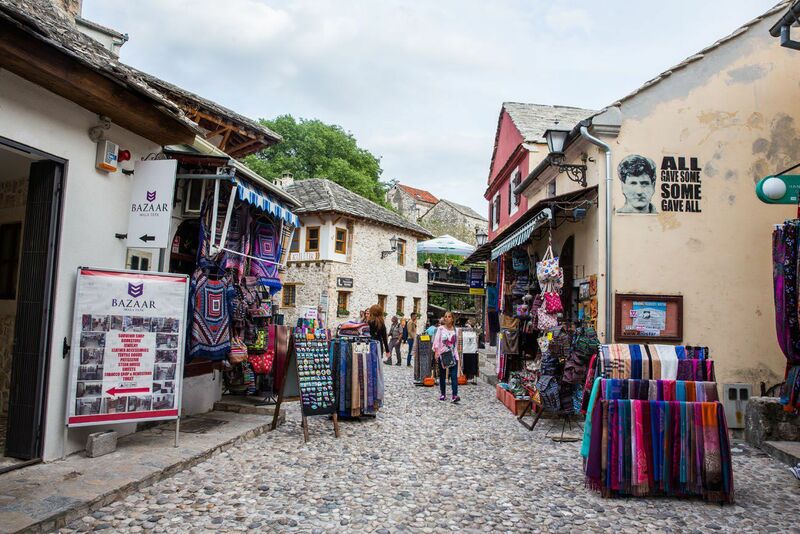 If you want more time in Mostar, consider hiring a rental car or traveling by public bus. 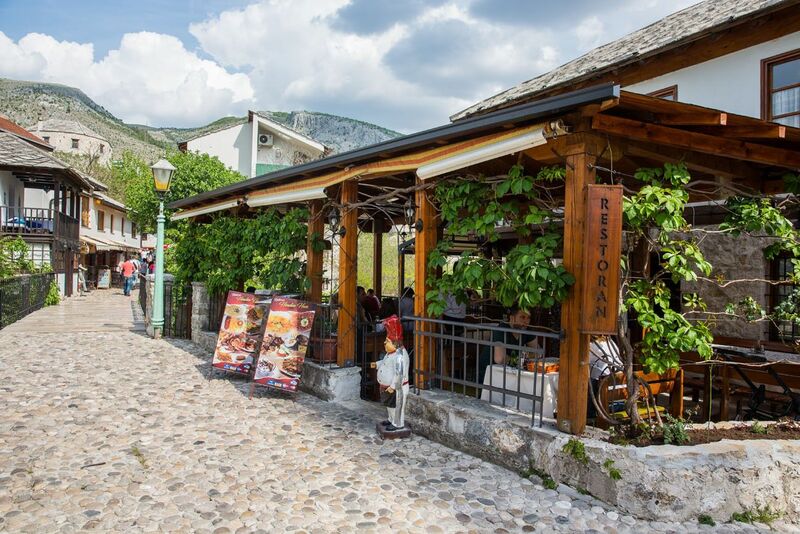 This restaurant serves traditional Bosnian food in a wonderful outdoor setting. It is located in a busy area of the Old Town. We ate lunch here, dining on dolma and kebabs. The best choice in Mostar for local food. Excellent food at low prices located right in the Old Town. 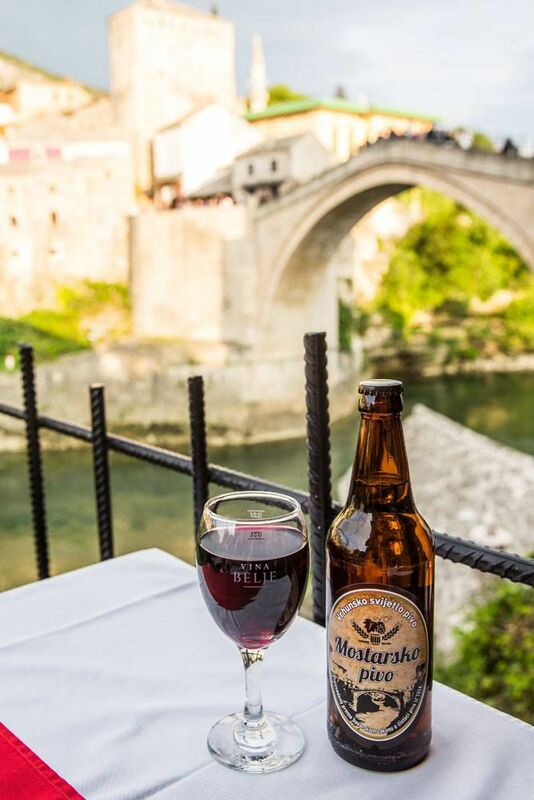 There are numerous riverside cafes with views of Stari Most and Restoran Lagero was our favorite. This is a great spot for dinner or just to sit back, have a drink, and enjoy the view. This is another popular spot in the Old Town. We ate dinner here, but after the reviews on Trip Advisor, this place did not seem to live up to the hype. The food was decent and the portions are large, but there are better restaurants in Mostar. This is where we stayed. Located in the Old Town just 5 minutes from the Old Bridge, this three-star hotel gets its name because it sits right next to the Crooked Bridge. It’s a beautiful hotel with an awesome location. Many visitors have a very positive experience here, but ours was less than perfect. We booked two rooms, one of them a superior room. There was some sort of mistake in the reservation system and our room was downgraded to a standard room. The room was acceptable, but since it was not what we reserved, we were unhappy with our experience here. Which is a shame, because we really looked forward to this place. Even though we did not have the best experience, this hotel still gets excellent reviews, maybe we just had bad luck on the day we visited Mostar. This is a four star hotel that gets brilliant reviews. Eden Villa is one of the pricier places to stay in Mostar, but what you get is a modern, clean, quiet accommodation with access to a spa. Since it is located just outside of the Old Town, parking your car (if you have one) is much easier than if you stay inside the Old Town. This is a four-star B&B located in the Old Town. On Trip Advisor it gets rave reviews for its perfect location, updated rooms, and excellent customer service. Enjoy Mostar! If you have any questions or comments, leave them in the comment section below. 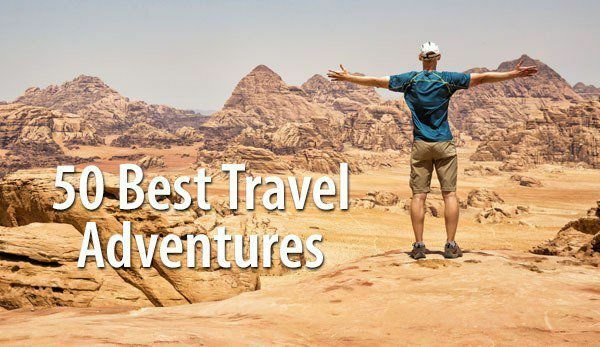 Planning a trip to Bosnia & Herzegovina? 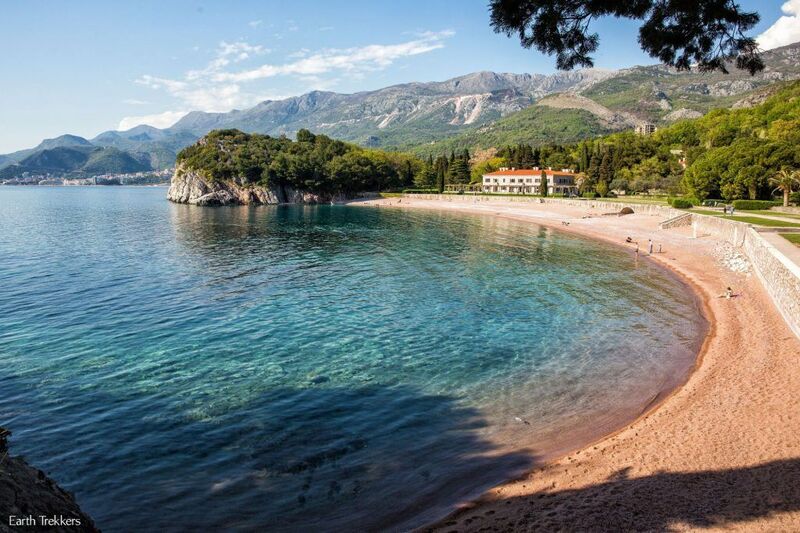 Read all of our articles about Bosnia & Herzegovina on our Bosnia & Herzegovina Destination page. Can you elaborate more on the hotel where you stayed? Aside from the mistake in room that was booked did you enjoy it, or where there other things you did not like? Where did you park? Any other thoughts would be appreciated! 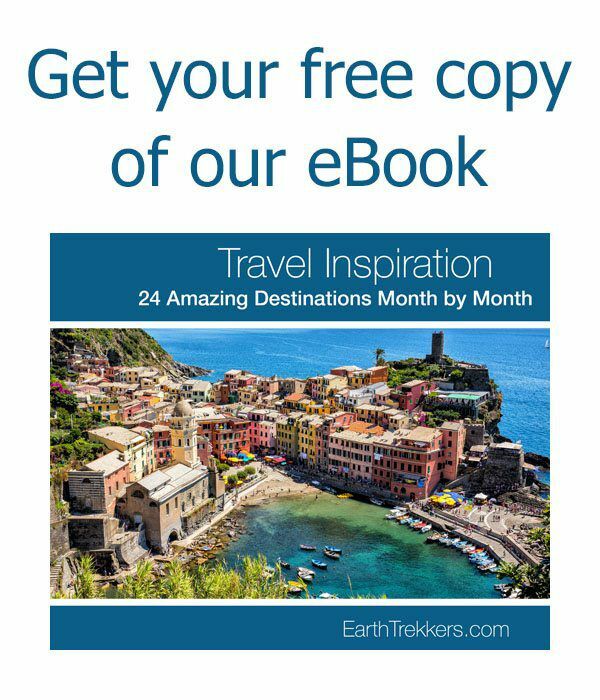 My husband and I are going to Croatia, B&H, and Montenegro in a few short weeks and are using your blog as guidance, so thank you. 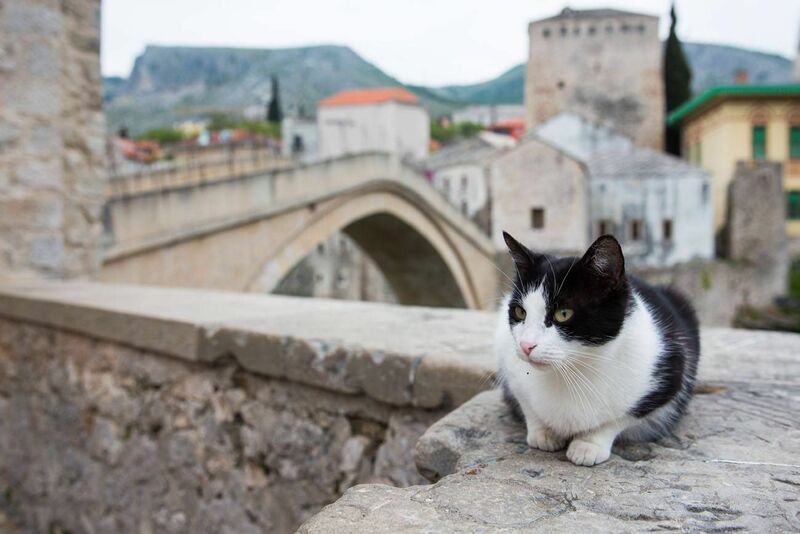 Great info on Mostar! We’re visiting in May (hopefully no rain!) 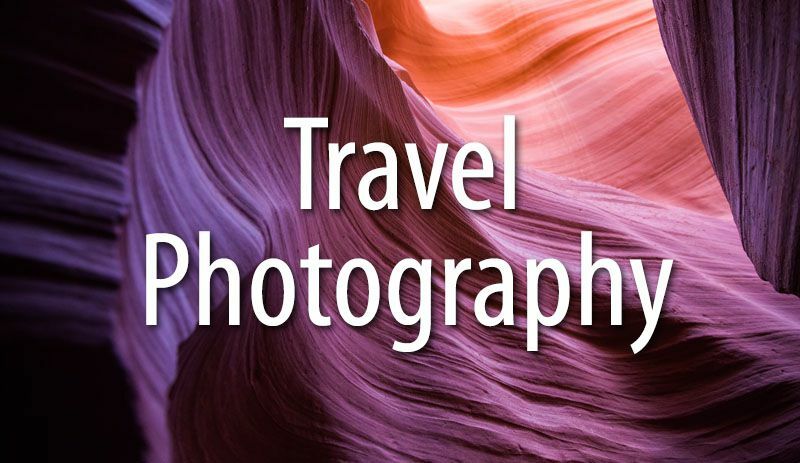 and it looks so beautiful in your photos. We’re still working on exactly how we’re going to get from Sarajevo to Mostar, since only 2 trains run per day and private transfers don’t seem too pricey. Thank you for your wonderful blog. 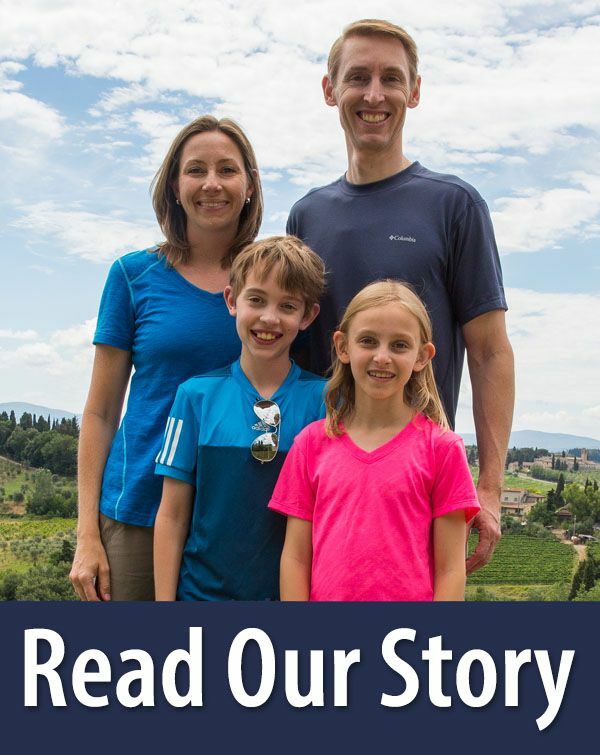 We are an American family currently living in Germany and taking advantage of this time to live so close to so many new sights and experiences. Every chance we get, we travel. 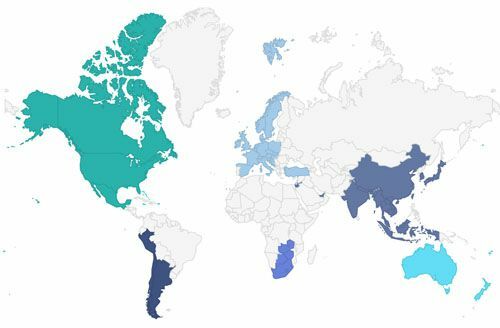 With all this travel, research is needed; so thank you for posting your experiences. I look forward to thoroughly reading about all your travels.